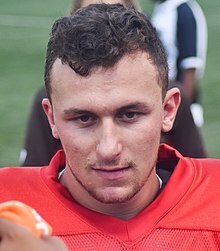 Johnathan Paul Manziel (/mænˈzɛl/ man-ZEL; born December 6, 1992) is an American football quarterback for the Memphis Express of the Alliance of American Football (AAF). He previously played two seasons with the Cleveland Browns of the National Football League (NFL) and was also a member of the Hamilton Tiger-Cats and Montreal Alouettes in the Canadian Football League (CFL) in 2018. Manziel was nationally recruited out of high school as a dual-threat quarterback, and he debuted for the Texas A&M Aggies as a redshirt freshman in Kevin Sumlin's Air Raid offense during A&M's first season in the Southeastern Conference (SEC) in 2012. He broke numerous NCAA Division I FBS and SEC records, which included becoming the first freshman and fifth player in NCAA history to pass for 3,000 yards and rush for 1,000 yards in a season. At the end of the regular season, he became the first freshman to win the Heisman Trophy, Manning Award, and the Davey O'Brien National Quarterback Award. Manziel capitalized on his redshirt freshman season by leading Texas A&M to a 41–13 victory over Oklahoma in the Cotton Bowl. Manziel was drafted by the Browns as the 22nd overall pick of the 2014 NFL Draft. Despite some success, he struggled with consistency and his tenure was overshadowed by off-field controversies. He was released by the Browns after the end of the 2015 season. Following further controversies during the 2016 offseason, Manziel could not be signed by another team before the start of the season and spent two years away from football until he returned with the Tiger-Cats in 2018. He was later traded to the Alouettes during the season, but was released the following year and rendered ineligible to play in the CFL after it was determined he violated the terms of his contract. Shortly after his release, Manziel signed with the Express during the AAF's inaugural season. TexAgs users tagged Manziel with the nickname "Johnny Football" during Manziel's sophomore high school football season in Texas. The nickname followed him to Texas A&M University. Manziel applied for and was granted a registered trademark for the nickname in 2013. Manziel was born in Tyler, Texas, on December 6, 1992, to Michelle (née Liberato) and Paul Manziel. He has a younger sister named Meri. Manziel's great-great-grandfather Joseph immigrated to the United States in 1883 from the Mount Lebanon region of Syria in what is now Lebanon. He is of Italian descent on his maternal side. His family became wealthy through the Texas petroleum industry. Manziel grew up playing a variety of sports, including football, basketball, baseball, and golf. At Tivy High School in Kerrville, Texas, he focused on baseball and football. However, in football, sportswriters, coaches, and parents said he "achieved folk hero status" and was compared to quarterbacks like Brett Favre, Michael Vick, and Drew Brees. At Tivy High School, Manziel played football for four years, beginning with the freshman team in his first year. By the end of his first season, he played with the varsity team as a receiver. He began his sophomore year primarily as a receiver, but started the fourth game at quarterback. He shared that position for the remainder of the season, finishing with 1,164 yards passing, 806 rushing and 408 receiving for a combined 28 touchdowns. His junior year was his first as starting quarterback, and he completed that season with 2,903 passing yards, 1,544 rushing yards, 152 receiving yards and 55 touchdowns. That year, he was voted All-San Antonio Area Offensive Player of the Year as well as District 27-4A MVP. During Manziel's senior season, he compiled 228-of-347 (65.7%) passing for 3,609 yards with 45 touchdowns and five interceptions. He also had 170 carries for 1,674 yards and 30 touchdowns. He had one touchdown reception and returned a kickoff for a touchdown for a combined 77 touchdowns. That year, he was honored as District 28-4A MVP (unanimous selection), Class 4A First Team All-State (AP), San Antonio Express-News Offensive Player of the Year (second year in a row), the Associated Press Sports Editors Texas Player of the Year, Sub-5A First Team All-Area (SA Express-News), No. 1 QB in Texas by Dave Campbell's Texas Football, DCTF Top 300, PrepStar All-Region and Super-Prep All-Region. For Manziel's three years as a starter, he completed 520-of-819 passes (63.5%) for 7,626 yards and 76 touchdowns, rushed 531 times for 4,045 yards and 77 touchdowns and caught 30 passes for 582 yards and another five touchdowns. He was the only quarterback in America named as a Parade All-American his senior year, and he was also named The National High School Coaches Association (NHSCA) Senior Athlete of the Year in football. He won the Mr. Texas Football award in 2010. Manziel was highly recruited out of high school; in addition to Texas A&M, he received offers from Baylor, Colorado State, Iowa State, Louisiana Tech, Oregon, Rice, Stanford, Tulsa, and Wyoming. Although he grew up a Texas Longhorns fan, the University of Texas did not recruit him. Although it was rumored that Texas wanted Manziel at defensive back, Texas coach Mack Brown said the rumor was not true. Though Manziel originally committed to play for Oregon, he later changed his commitment to the Aggies, thanks to the influence of then-quarterbacks coach Tom Rossley. Manziel was named to the NUC All World Game (started by David Schuman and National Underclassmen Combine) in 2010 where he rushed for over 100 yards and threw for over 200. It was the first time Manziel dominated on a national stage. He played in the game as a teammate with Oregon QB Marcus Mariota. "Texas A&M Football Commitments". Rivals.com. Retrieved December 14, 2011. "2011 Texas A & M College Football Recruiting Commits". Scout.com. Retrieved December 14, 2011. "ESPN". ESPN.com. Retrieved December 14, 2011. "Scout.com Team Recruiting Rankings". Scout.com. Retrieved December 14, 2011. "2011 Team Ranking". Rivals.com. Retrieved December 14, 2011. Manziel received an athletic scholarship to attend Texas A&M University, where he attended under coach Mike Sherman in 2011 and played for new coach Kevin Sumlin from 2012 to 2013. Manziel was redshirted during the 2011 season and did not play in any games. He made the travel squad after enrolling with the college in January. Texas A&M faced uncertainty at the quarterback position when Ryan Tannehill left for the National Football League after the 2011 season. Manziel performed well during spring ball and fall practices and won the starting job over Jameill Showers and Matt Joeckel before the season began. His first game was supposed to be against Louisiana Tech in Shreveport, Louisiana on Thursday, August 30, 2012, but the game was postponed until October 13 due to Hurricane Isaac hitting the Louisiana coast two days prior to game time. Consequently, Manziel's college football debut was played as a redshirt freshman against the Florida Gators before a home crowd at Kyle Field. Although Manziel began the season in relative obscurity, his play against Arkansas in which he broke Archie Manning's 43-year-old total offense record gained him some attention. Manziel produced 557 yards of total offense, breaking Manning's record of 540. Two games later, Manziel surpassed his own total offense record against No. 24 Louisiana Tech by achieving 576 yards of total offense, becoming the first player in SEC history to have two 500+ total offense games in one season. After Texas A&M's blowout of Auburn in the eighth game of the season, in which Manziel accounted for 3 passing and 2 rushing touchdowns through only the first half plus one series in the second, Manziel began showing up in national Heisman Watch lists. Manziel was launched into the national scene after he led Texas A&M to a 29–24 victory over No. 1 Alabama in Tuscaloosa. In that game, Manziel accounted for 345 of A&M's 418 yards of offense, including two passing touchdowns. In the following days, Manziel became the frontrunner for the Heisman Trophy in most national watch lists and polls due to his performance during the game combined with other Heisman frontrunners faltering. On November 24, during the game against the Missouri Tigers before a home crowd, Manziel left the game with an apparent knee injury late in the first quarter. He returned to the field for the next series of downs wearing a knee brace and finished the game with 439 yards of total offense, including 3 passing and 2 rushing touchdowns. During the game, he broke the single season record for offensive production in the SEC with 4,600 yards, surpassing Cam Newton and Tim Tebow, notable recent Heisman Trophy winners. He also became the first freshman and only the fifth player in NCAA history to pass for 3000 and rush for 1,000 yards in a season, reaching that mark two games earlier than any other player. He won the SEC Freshman of the Year Award and College Football Performance National Freshman of the Year Award. Manziel won the Davey O'Brien Award on December 6 and the Heisman Trophy on December 8, making him the first freshman ever to win either award. Texas A&M started the 2013 season with a No. 6 ranking in the Coaches Poll. Prior to the season, some journalists argued that Manziel could suffer a sophomore slump, while others felt that he would continue to have success. Manziel's eligibility for the 2013 season was under question after reports surfaced that he had signed autographs for money in January 2013. On August 28, 2013, the NCAA reached an agreement with Texas A&M to suspend Manziel for the first half of the team's game against Rice (the first game of the season), after acknowledging that Manziel did not receive any money for the autographs. In the game against No. 1 Alabama, Manziel threw for a school record of 464 yards and 5 touchdowns in the 49–42 loss. His primary target during the game was Mike Evans, who compiled 7 receptions for a school record of 279 yards. In the 51–41 win over Mississippi State, Manziel tied his single-game career-high five touchdowns, while also throwing for 446 yards but with 3 interceptions. He was fifth in Heisman Trophy voting in 2013. As a Texas Rangers fan growing up, Manziel was a middle infielder at Tivy High School before foregoing his baseball career in favor of football. He played baseball through his junior year, but he skipped out on his senior season so he could graduate early and focus on preparing for his freshman football season at Texas A&M. Manziel's passion for the game of baseball, however, did not diminish after high school. He briefly discussed the possibility of playing collegiate ball with Texas A&M's baseball coaches, but that never came to fruition once he won the starting quarterback job as a redshirt freshman. In the 2014 Major League Baseball draft, Manziel was drafted in the 28th round (837th overall pick) by the San Diego Padres as a shortstop. In January 2014, Manziel announced that he would forgo his junior season and enter the 2014 NFL Draft. He was projected to be a first-round pick, and as of January 15, 2014, his draft stock was reported to be rising by a consensus of experts who had him pegged as a top-5 pick. Manziel elected to throw during Texas A&M's Pro Day on March 27, 2014, instead of during the NFL Combine. During his pro day, Manziel completed 64 of 66 passes to six different receivers. His pro day performance was well received by sports journalists. Prior to the 2014 NFL Draft, Manziel became one of the most polarizing athletes in pre-draft history, with scouting opinions varying from "undraftable" to "rare competitor". Former NFL head coach Barry Switzer took it to a personal level, criticizing Manziel, saying: "I don’t like his antics. I think he's an arrogant little prick. I’ve said that and I’ll say it again." On draft day, 21 teams, including the Cleveland Browns, passed over Manziel. While Manziel was waiting to get drafted, he texted then-Browns quarterbacks coach Dowell Loggains that he wants to "wreck the league" in Cleveland. Loggains forwarded the text to head coach Mike Pettine, who made the decision to trade up to draft Manziel. The Browns drafted him at the 22nd overall pick. On August 22, 2014, Manziel was fined $12,000 by the NFL for a hand gesture (flipping the bird) that he made in a preseason loss to the Washington Redskins. Fellow quarterback Brian Hoyer was named the starter over Manziel for the opening regular-season game. On November 30, 2014, Manziel entered the game against the Buffalo Bills during the fourth quarter after an ineffective performance by starting quarterback Brian Hoyer. Manziel went 5 of 8 for 63 yards, and scored his first NFL touchdown on a 10-yard rush in the fourth quarter. The Browns lost 26–10. Manziel made his first NFL start in the Browns' Week 15 game against the Cincinnati Bengals. Manziel completed 10 of 18 passes for 80 yards and two interceptions for a 27.3 passer rating while being sacked three times. The Browns lost 30–0. Manziel completed three of eight passes in his second career start against the Carolina Panthers on December 21, 2014. He left the game with a hamstring injury with less than two minutes remaining in the first half and was replaced by Hoyer. The Browns went on to lose 17–13. Manziel was ruled out for the Browns' regular season finale against the Baltimore Ravens. Overall, Manziel completed 18 of 35 passes for 176 yards and two interceptions, and rushed nine times for 29 yards and one touchdown. Manziel's work ethic and commitment were questioned by over 20 sources within the Cleveland Browns. An anonymous player even called Manziel's rookie season a "100 percent joke." Others within the organization were hopeful about Manziel's future, including cornerback Joe Haden. On August 27, Manziel was ruled out for the rest of the preseason with recurring pain in his right elbow. Manziel had been making noticeable improvement in his play. On September 13, Manziel was brought into the game against the New York Jets after starting QB Josh McCown was injured in the first half. Manziel scored his first career passing touchdown with a 54-yard pass to WR Travis Benjamin. However, Manziel committed three turnovers in the second half (two of them being fumbles) as the Jets won 31–10. Manziel started the Week 2 game against 2014 Heisman Trophy winner Marcus Mariota and the Tennessee Titans. He completed 8 of 15 passes for 172 yards and 2 touchdowns to Travis Benjamin in the 28–14 win. Following McCown's recovery, Manziel did not take the field again until McCown suffered a shoulder injury in the fourth quarter of a Week 7 game against the St. Louis Rams. Manziel completed 4 of 5 passes for 27 yards in a 24–6 loss. In a Week 8 game against the Arizona Cardinals, Manziel again took the field in the fourth quarter after McCown suffered another injury. Manziel made his second start of the season in Week 9, completing 15 of 33 passes for 168 yards and one touchdown in a 31–10 loss to the Cincinnati Bengals. In Week 10, Manziel had his statistically best game against the Pittsburgh Steelers, completing 33 of 45 passes for 372 yards and one touchdown. Despite his efforts, however, the Browns lost 30–9. Manziel was announced as the starting quarterback for the rest of the season on November 17. However, Manziel was demoted to third-string quarterback behind McCown and Austin Davis a week later after videos surfaced of him partying in Texas over the bye week. 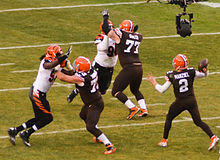 As a result, Manziel remained benched in favor of Davis when McCown suffered a season-ending collarbone injury in the subsequent game against the Baltimore Ravens. Manziel was promoted to starter again after the Bengals defeated the Davis-led Browns 37–3. Despite throwing a maligned interception in his return performance, Manziel completed 21 of 31 passes for 270 yards and one touchdown in a 24–10 victory over the San Francisco 49ers, ending the Browns' seven-game losing streak. Manziel sat out the last game of the 2015 season with a concussion, with reports circulating that he was in Las Vegas instead of in Cleveland with the team that weekend. The team confirmed that Manziel did miss a scheduled check-in on the morning of the last game of the season. In early February 2016, NFL Network's Ian Rappaport and ESPN's Pat McManamon reported that the Browns planned to cut ties with Manziel as soon as the league's fiscal 2016 began. Earlier, following news that Manziel was being investigated for a domestic violence incident with his ex-girlfriend (see below), the Browns released a statement saying that Manziel's continued disregard of their "expectations for our players on and off the field" had undermined the Browns' reputation, and that they intended to address his status "as soon as permitted by league rules." The Browns released him on March 11, 2016. On March 31, 2017, the Canadian Football League's Hamilton Tiger-Cats revealed that they had placed Manziel on their negotiation list, a list of players that each individual team has exclusive rights to attempt to sign. The revelation was an unprecedented move, as CFL teams had previously kept their negotiation lists secret. After a year out of football, Manziel had a workout in Buffalo, New York with the Tiger-Cats, during which he was "put through a series of physical and medical tests" from August 23 to 24, 2017. He did not initially sign with the team. On September 2, Manziel's representatives requested a contract offer from the Tiger-Cats. According to CFL rules, the Tiger-Cats then had 10 days to offer Manziel a contract, trade his rights or relinquish his rights. However, the CFL later extended the 10-day window so that the league could "facilitate a process of evaluation for the player." Manziel also had a meeting with CFL commissioner Randy Ambrosie in September. On September 27, the CFL announced that Manziel would not be allowed to sign with any CFL team for the 2017 season but would be able to sign with a team for the 2018 season if Manziel meets "certain conditions". On December 28, 2017, the CFL approved Manziel to play in the league. The Tiger-Cats had until January 7 to offer Manziel a contract or trade his rights. If neither was done, the team would lose his rights. On January 7, the team confirmed that they had made Manziel an offer. Not long after Manziel's agent, Eric Burkhardt, responded to the Tiger-Cats offer stating that Hamilton has until January 31, 2018 to offer his client a "fair deal". Failure to do so will result in Manziel turning his attention to "several other professional options". Burkhardt is insisting that Manziel be paid in the same realm as Tiger-Cats' quarterback Zach Collaros was last season; i.e., something in the range of $500,000 to $550,000. The Tiger-Cats released a statement on February 14 implying they had broken off negotiations with Manziel. The same day, he agreed to play in The Spring League, a non-paying developmental league, for the 2018 season. He was the quarterback at Texas A&M's 2018 pro day, throwing passes to potential 2018 NFL Draft prospects in front of representatives from all 32 NFL teams and the CFL. After the session, Manziel reiterated that his primary goal was to play in the NFL in 2018, but if that did not occur he would play in the CFL. On May 19, 2018, Manziel and the Tiger-Cats announced that they had agreed to a two-year contract. On July 22, after spending the first six weeks on Hamilton's bench without playing, as backup to Jeremiah Masoli, the Tiger-Cats traded Johnny Manziel and offensive linemen Tony Washington and Landon Rice to the Montreal Alouettes for defensive lineman Jamaal Westerman, wide receiver Chris Williams, and Montreal's 2020 and 2022 first round draft picks. On July 31, Alouettes head coach Mike Sherman announced that Manziel would start their August 3 game against the Tiger-Cats, his former team. By halftime of his first CFL start Manziel had thrown four interceptions, including two by Jumal Rolle. Hamilton defeated Montreal 50–11. Manziel showed improvement and did not throw any interceptions in his second start, a 24–17 loss to the Ottawa Redblacks on August 11. In the third quarter, Manziel, after a 17-yard run, received a hard hit to the head from Ottawa's Jonathan Rose and fumbled the ball at the goal line, where the ball was recovered by Montreal's Kristian Matte for a touchdown. In the days following the game, Manziel missed practice and was placed in the CFL's concussion protocol. Manziel was placed on the injured list with Antonio Pipkin starting Montreal's next game at quarterback in Manziel's place. Pipkin started two games while Manziel recovered from his concussion, and then two additional games after Manziel had recovered. Following a four interception game by Pipkin in Week 14, Manziel took over the reins as starting quarterback for the Alouettes in Week 15, a game they would end up losing 31-14 to the Blue Bombers. Manziel played in eight games in his first season in the CFL, completing 106 of 165 pass attempts (64.2%) for 1,290 yards with five touchdowns and seven interceptions. He also rushed the ball 29 times for 215 yards. Manziel was said to have struggled during his first season at the CFL and NBC Sports writer Michael David Smith said it "wasn't great" despite Manziel's satisfaction with how he played. Manziel's performance throughout the season gradually improved and was attributed to his becoming accustomed to CFL rules. Manziel was slated to compete with Antonio Pipkin and Vernon Adams for the starting role in 2019, but on February 27 it was revealed that the Alouettes released him on orders from the CFL after league officials determined that he had "contravened" the terms of his CFL contract. The CFL also barred him from signing with any other CFL team. Manziel had previously revealed that as part of his agreement with the league, he was required to see a doctor, attend weekly sessions with a therapist, and submit to weekly lithium tests. According to veteran CFL journalist Justin Dunk, the league decided to cut ties with Manziel after he missed a number of required meetings. On March 16, 2019, Manziel signed an agreement to join the Alliance of American Football. Under the league's regional allocation process, the San Antonio Commanders had the first opportunity to sign him via his Texas A&M connections, but the Commanders elected to waive his rights. As a result, he was assigned to the 1–5 Memphis Express through the waiver system, as the Express needed a quarterback to replace the injured Zach Mettenberger and the struggling Christian Hackenberg. Manziel made his debut against the Birmingham Iron on March 24, playing three drives in the second and third quarters as a backup to Brandon Silvers. He completed three of five passes for 48 yards, along with running for 20 yards as the Express won 31–25. The next week, Manziel made his first start in a March 30 game against the Orlando Apollos, but suffered a concussion after throwing an interception that removed him from the game. Three days later, the AAF suspended football operations, ending the 2019 season. In 10 games, Manziel had 4 of the top 10 games in total offense in Texas A&M history. Logged 10 straight games with 300 or more total yards, 21 total games with 300+ yards. Third Texas A&M quarterback to surpass 3,000 passing yards in a season. First Texas A&M quarterback to have multiple 3,000-yard seasons. Texas A&M career total touchdowns record with 94 touchdowns. Texas A&M career total yards record with 9,989 yards. Third Texas A&M quarterback to surpass 7,000 passing yards in a career. Most passing yards in a single season. Second Texas A&M quarterback to rush for 2,000 yards. The most rushing touchdowns in a single season. The most passing touchdowns in a single season. 2nd in career passing touchdowns. 2nd in career passing yards. Tied for 12th in career rushing touchdowns. 15th in career rushing yards. Cleveland Browns franchise record for most rushing yards by a QB in a single game (108). On June 29, 2012—before he was chosen as Texas A&M's starting quarterback and before his first college game—Manziel was arrested and charged with three misdemeanors—disorderly conduct, failure to produce identification, and possession of a fictitious driver's license. These charges stemmed from a late-night fight in College Station, Texas. In July 2013, he pleaded guilty to failure to produce identification, and the other two charges were dismissed. Police reports stated that Manziel was with a friend who directed a racial slur at a man on the street. The man then approached the two of them and tried to get at the friend, but Manziel placed himself between the two men, saying his friend didn't mean it and he was going to take him home. The man continued pushing against Manziel to reach the other man, and Manziel eventually pushed back. At this point, the man swung at Manziel who then began fighting back. Shortly afterwards, the bicycle patrol officers arrived. Manziel was 19 at the time, and he presented to police officers a fake Louisiana driver's license that showed him to be 21 years of age. Manziel was taken into custody and reportedly spent the night in jail. After the incident, Manziel eventually regained the favor of his team and head coach Kevin Sumlin, and was named the starting quarterback. Sumlin's policy precluded freshmen from giving media interviews, and Manziel was unable to speak to reporters about his arrest until the end of the 2012 regular season. When reporters asked about the incident during his first press conference on November 27, Manziel stated that he had learned from the mistake and "had to make a lot of changes in [his] life." During the 2013 offseason at Texas A&M, Manziel drew significant media attention over his behavior off the field. Notable incidents include his early departure from the Manning Passing Academy after allegedly oversleeping, tweeting that he "can't wait to leave College Station" after receiving a parking ticket, and getting kicked out of a University of Texas fraternity party. An ESPN The Magazine article revealed his parents' concerns about his dealings with his newfound stardom. On August 4, ESPN reported that the NCAA was investigating whether Manziel accepted payments for autographs that he had signed in January 2013. The NCAA did not find any evidence that Manziel accepted money for the autographs, but reached an agreement with Texas A&M to suspend him for the first half of the season opener against Rice University, due to an "inadvertent violation" of NCAA rules. On February 4, Manziel entered a treatment program for unspecified reasons. On May 30, Manziel was involved in an incident with a heckler at the AT&T Byron Nelson golf tournament. The heckler had been continually asking for an autograph, to the point that Manziel became fed up and threw a water bottle at the man. The water bottle missed the heckler. Security and police were called, but no criminal charges were filed. During October of the 2015 season, Manziel was pulled over by a policeman after fighting in his car with his then girlfriend, Colleen Crowley. Although no charges were made, Manziel admitted to having had some alcoholic drinks earlier that afternoon. On November 24, a week after Manziel was announced as the Browns' starter for the remainder of the season, head coach Mike Pettine demoted Manziel to third string after a video of him partying surfaced on the Internet. It was later revealed Manziel reportedly lied about the video. On January 2, 2016, Manziel was seen at Las Vegas' Planet Hollywood casino the night before the Browns played their final game of the 2015 season. Manziel was scratched from the final game because of a concussion. As word of his appearance at the casino spread across social media, he posted a photo on Instagram of himself and his dog at home. The next day, Manziel failed to report to the Browns on Sunday morning when he was supposed to report to the team medic, which all players with concussions are supposed to do. Sports Illustrated's Peter King also added that the Browns are "so done with Manziel" and he "wants to go to Dallas." On January 6, 2016, Manziel's marketing agency, LRMR, announced that it would no longer work with Manziel. Manziel's agent, Erik Burkhardt, also announced that he would no longer represent Manziel. On February 5, 2016, the Dallas Police Department announced that they are opening a criminal investigation with a claim of domestic violence involving his ex-girlfriend, Colleen Crowley. Dallas police had originally closed the case, but re-opened it with allegations stemming from an altercation on January 30, 2016, at a downtown Dallas hotel. According to Crowley, Manziel forced her into a car, pulled her by the hair, and threatened to kill both her and himself. According to ESPN and NFL Network, this incident was the last straw for the Browns, and was a factor in their decision to cut ties with him." On April 24, Manziel was indicted by a Dallas grand jury on misdemeanor assault charges for the incident. On April 19, 2016, after just two months of representing him, agent Drew Rosenhaus terminated Manziel as a client, marking the first time in Rosenhaus' 27-year career he fired an NFL player. On the same day, Nike ended its sponsorship with Manziel. On June 24, 2016, Manziel's attorney, Bob Hinton, accidentally sent a lengthy text message to the Associated Press relating to Manziel's defense in his domestic violence case. In the message, Hinton expressed concerns about Manziel's ability to stay clean, saying that he was given a receipt that suggests Manziel spent around $1,000 at The Gas Pipe, a drug paraphernalia store. On the same day, Manziel's father, Paul, told ESPN: "He's a druggie. It's not a secret that he's a druggie. Hopefully, he doesn't die before he comes to his senses. I mean, I hate to say it, but I hope he goes to jail. I mean, that would be the best place for him. I'm doing my job, and I'm going to move on. If I have to bury him, I'll bury him." On June 30, 2016, he was suspended for the first four games of the 2016 season for violating the NFL's substance abuse policy. On September 5, Manziel returned to his alma mater to take classes. On December 2, 2016, Manziel and prosecutors finalized a plea agreement in which Manziel agreed to undergo counseling and have his conduct monitored by prosecutors for up to a year or face prosecution. Manziel is a friend of rap artist Drake and in April 2014, Drake released a track entitled "Draft Day", which includes a shoutout to Manziel. On March 10, 2017, Manziel became engaged to Bre Tiesi; the two were married in a private ceremony in March 2018. They separated a year later. In a February 2018 interview, Manziel recounted his personal problems, and has stated that he had been diagnosed with bipolar disorder. ^ "Johnny Manziel". Rivals.com. Yahoo! Sports. Retrieved January 1, 2014. ^ Sam Khan Jr. (August 16, 2012). "Redshirt freshman QB Johnny Manziel to start for A&M". ESPN. Retrieved January 1, 2014. ^ Jim Henry (August 2, 2013). "Charlie Ward's advice to Johnny Manziel: Prepare for 'barrage'". USA Today. Retrieved January 1, 2014. ^ a b Russo, Ralph D. (December 8, 2012). "'Johnny Heisman': Manziel first freshman to win trophy". KHOU. Archived from the original on June 26, 2013. Retrieved December 23, 2014. ^ a b c d e f g h i j k l Casey Bienvenu (January 10, 2013). "Johnny Manziel Earns 2013 Manning Award". All State Sugar Bowl. All State Sugar Bowl. Retrieved January 1, 2014. ^ "Texas A&M's Johnny Manziel, Luke Joeckel win national awards". theeagle.com. BH Media Group Holdings, Inc. Associated Press. December 7, 2012. Retrieved January 1, 2014. ^ Hawkins, Stephen. "Manziel, Texas A&M beat Oklahoma 41–13 in Cotton". Associated Press. Retrieved January 5, 2013. ^ a b Brady, James. "Johnny Manziel pulled over by police after arguing with girlfriend, drinking". SB Nation. ^ a b Perez, A.J. "Browns bench Johnny Manziel for party video, name Josh McCown starter". USA Today. ^ a b McManamon, Pat. "Johnny Manziel demoted after lying to team about timeline of video". ESPN. ^ a b Boeck, Scott. "Johnny Manziel spotted at Las Vegas casino on eve of season finale". USA Today. Retrieved January 4, 2016. ^ a b c "Police investigate domestic violence claim against Johnny Manziel". ESPN. February 5, 2016. Retrieved February 5, 2016. ^ a b "Johnny Manziel's lawyer sends accidental text indicating plea deal". ESPN. Retrieved June 25, 2016. ^ a b "Johnny Manziel suspended four games for violating drug policy". espn.go.com. June 30, 2016. Retrieved June 30, 2016. ^ KBTX Sports. "Johnny Football: A nickname coined in Aggieland, a legend crafted in the Hill Country". Retrieved September 23, 2012. ^ John Taylor (October 14, 2012). "'Johnny Football' one of two Camp honorees". College Football Talk. NBC Sports. Retrieved January 1, 2014. ^ "Serial Trademark Number #85839336 – "Johnny Football"". Trademark Status and Document Retrieval System, United States Patent and Trademark Office. tsdr.uspto.gov. ^ Burke, Timothy (August 12, 2013). "The Long Con: How The Manziels Conquered America". Deadspin. Retrieved October 19, 2015. ^ Wilson, Christopher (August 4, 2013). "Report: The NCAA is investigating Johnny Manziel". Yahoo! Sports. Retrieved January 1, 2014. ^ a b Krider, Dave (December 2, 2010). "Johnny Manziel is already a Texas legend". MaxPreps.com. Retrieved October 19, 2015. ^ "Johnny Manziel Biography". Texas A&M. Archived from the original on November 1, 2013. Retrieved October 19, 2015. ^ "NHSCA Announces National High School Senior Athletes of the Year". Retrieved November 15, 2012. ^ "Football Recruiting – Johnny Manziel – Player Profiles". ESPN. Retrieved January 1, 2014. ^ Mike Foss (September 27, 2013). "Mack Brown says he 'never' offered Johnny Manziel a scholarship". For The Win. Gannett Company. Retrieved January 1, 2014. ^ "Former QB coach Tom Rossley recognized Manziel's talent". Aggie Sports. BH Media Group Holdings, Inc. December 7, 2012. Retrieved January 1, 2014. ^ Kevin Kleps (January 3, 2013). "College football: Harvey grad Tom Rossley had sights set on Heisman winner Johnny Manziel early". The News-Herald. The News-Herald. Retrieved January 1, 2014. ^ "Johnny Manziel Rivals Recruiting Profile". July 7, 2015. ^ "Johnny Manziel Biography". Texas A&M Athletics. ^ Fasulo, Nick. "Texas A&M Names Johnny Manziel Starter, To Some Surprise". Retrieved September 13, 2012. ^ "Hurricane Isaac postpones game". ESPN. August 28, 2012. Retrieved January 1, 2014. ^ "National Freshman". College Football Performance Awards. College Football Performance Awards. Retrieved January 1, 2014. ^ "No. 6 Texas A&M could be more potent than last season". Green Bay Press Gazette. Gannett Company. August 1, 2013. Retrieved January 1, 2014. ^ erict693 (May 20, 2013). "Johnny Manziel Redux: How Have Previous Heisman Winners Fared the Next Season?". St. Augustine Web Services. St. Augustine Web Services, LLC. Retrieved January 1, 2014. ^ Teddy Greenstein (June 19, 2013). "How will Manziel perform this season?". Chicago Tribune. Retrieved January 1, 2014. ^ Mark Bradley (August 2, 2013). "Ranked team apt to flop? Johnny Manziel's team". ajc.com. The Atlanta Journal-Constitution. Retrieved January 1, 2014. ^ Vinnie Vinzetta (July 25, 2013). "COMMENTARY: Johnny Manziel to deliver a sophomore year sequel". Kens5.com. Gannett Company. Retrieved January 1, 2014. ^ Ryan Adverderada (July 31, 2013). "Johnny Manziel's Sophomore Slump?". Football and Futbol. Football and Futbol. Retrieved January 1, 2014. ^ Duane Rankin (August 3, 2013). "Duane Rankin: Manziel the winner outshines the sinner". Montgomery Advertiser. Retrieved January 1, 2014. ^ a b "Johnny Manziel of Texas A&M Aggies suspended for 1st half of season opener against Rice Owls – ESPN". ESPN Internet Ventures. August 29, 2013. Retrieved January 1, 2014. ^ Fox Sports (December 18, 2013). "Southwest | FOX Sports on MSN". Foxsportssouthwest.com. Retrieved January 1, 2014. ^ Watson, Graham (November 9, 2013). "Winners and Losers: Johnny Manziel might have played his final game at Kyle Field". Yahoo! Sports. Retrieved November 9, 2013. ^ "Johnny Manziel". ESPN. Retrieved February 3, 2016. ^ Casella, Paul. "Johnny Baseball? Manziel drafted by Padres". MLB.com. Retrieved June 7, 2014. ^ "Padres draft Johnny Manziel 837th". ESPN. Associated Press. June 9, 2014. Retrieved October 19, 2015. ^ Troy Machir (June 7, 2014). "MLB Draft: Padres draft Johnny Manziel in 28th round". www.sportingnews.com. Retrieved June 7, 2014. ^ McGinn, Bob (May 1, 2014). "Rating the NFL draft prospects: Quarterbacks". JSOnline.com. Archived from the original on August 16, 2017. Retrieved June 16, 2018. ^ "NFL Combine profile for Johnny Manziel". NFL.com. Retrieved March 16, 2014. ^ "Johnny Manziel to enter NFL draft". ESPN. ^ "Johnny Manziel's NFL Draft Stock Is Soaring". Business Insider. ^ "NFL draft: Johnny Manziel puts glitz in outstanding pro day effort". Yahoo! Sports. ^ "Johnny Manziel impresses at pro day". ESPN. ^ "Johnny Manziel shines at circus-like pro day workout". NFL. ^ "Johnny Manziel shows 'a little bit of Hollywood' at strong pro day". USA Today. March 27, 2014. ^ "Opinions vary wildly on Johnny Manziel, from 'arrogant' to 'almost undraftable' to 'rare competitor'". Yahoo! Sports. ^ "Former Oklahoma coach Barry Switzer says he would 'never recruit a white quarterback'". Yahoo! Sports. ^ Josh Sanchez (May 16, 2014). "Johnny Manziel vowed to 'wreck this league' in mid-draft text to Cleveland Browns". Retrieved February 3, 2016. ^ "Johnny Manziel selected by Cleveland Browns No. 22 overall in NFL Draft 2014". cleveland.com. Retrieved February 3, 2016. ^ "Johnny Manziel fined for gesture". ESPN. September 7, 2014. ^ Louis Bien (August 20, 2014). "Brian Hoyer named Browns starter over Johnny Manziel". SBNation.com. Vox Media. Retrieved February 3, 2016. ^ "Browns QB Johnny Manziel scores first TD in relief of Brian Hoyer". USA Today. ^ Glazer, Jay (December 9, 2014). "Glazer: Browns name Johnny Manziel starting quarterback". foxsports.com. Retrieved December 9, 2014. ^ Greenberg, Neil (December 14, 2014). "Johnny Manziel Era starts poorly for Cleveland Browns". washingtonpost.com. Retrieved December 14, 2014. ^ Greetham, Fred (December 21, 2014). "For the Browns, it's important to finish 8–8". foxsports.com. Retrieved December 21, 2014. ^ Fowler, Jeremy (December 22, 2014). "Johnny Manziel won't play in finale". espn.go.com. Retrieved December 22, 2014. ^ Jeremy Fowler and Pat McManamon, "Inside Manziel's rocky rookie season," ESPN, January 24, 2015. ^ Withers, Tom (August 27, 2015). "Johnny Manziel out for rest of preseason with elbow injury". Retrieved August 28, 2015. ^ Weitzman, Yaron. "Johnny Manziel named Browns starter for remainder of the season". SB Nation. Vox Media. Retrieved November 25, 2015. ^ ESPN.com news services. "Browns to start Josh McCown over Johnny Manziel at quarterback". espn.go.com. ESPN. Retrieved November 24, 2015. ^ ESPN.com news services. "Browns move QB Johnny Manziel back to starting role". espn.go.com. ESPN. Retrieved December 8, 2015. ^ SI.com news services. "Manziel proves crucial as Browns soundly defeat 49ers in team effort". Sports Illustrated. Retrieved December 8, 2015. ^ "Johnny Manziel spotted at Las Vegas casino on eve of season finale". USA TODAY. January 2, 2016. Retrieved February 3, 2016. ^ Bonesteel, Matt (March 11, 2016). "Johnny Manziel is cut by the Browns". The Washington Post. Retrieved December 8, 2016. ^ a b "Cleveland Browns will cut Johnny Manziel on March 9". NFL Network. February 2, 2016. ^ a b Pat McManamon (February 3, 2016). "Browns to move on from Johnny Manziel after latest incident". ESPN. ^ Prisbell, Eric (March 11, 2016). "Browns waive Johnny Manziel after two rocky years". USA TODAY. Retrieved March 11, 2016. ^ "Ticats to become first CFL team to reveal negotiation list – Article – TSN". TSN. March 31, 2017. Retrieved April 3, 2017. ^ "TICATS CONFIRM MANZIEL WORKOUT; NO DEAL IMMINENT". cfl.ca. Retrieved December 23, 2017. ^ Ralph, Dan (September 14, 2017). "Source: Potential trade results in extension of Johnny Manziel CFL saga". edmontonjournal.com. Retrieved December 23, 2017. ^ Seifert, Kevin (September 27, 2017). "Johnny Manziel won't play in CFL this season, but eligible in 2018 if criteria met". espn.com. Retrieved December 23, 2017. ^ Seifert, Kevin (September 15, 2017). "CFL extends window to mull Johnny Manziel possibility". espn.com. Retrieved December 23, 2017. ^ "MANZIEL TELLS ESPN'S ADAM SCHEFTER HE HAD 'POSITIVE MEETING WITH AMBROSIE'". cfl.ca. September 27, 2017. Retrieved December 23, 2017. ^ "CFL ISSUES STATEMENT REGARDING STATUS OF JOHNNY MANZIEL". cfl.ca. September 27, 2017. Retrieved December 23, 2017. ^ "CFL approves potential Manziel deal for 2018". ^ Seifert, Kevin (January 7, 2018). "Tiger-Cats negotiating contract with Johnny Manziel". espn.com. Retrieved January 7, 2018. ^ "Manziel gives Tiger-Cats deadline to make him their QB – Sportsnet.ca". Sportsnet.ca. Retrieved January 9, 2018. ^ "The Manziel contract situation just got complicated – Article – TSN". TSN. January 9, 2018. Retrieved January 9, 2018. ^ "Statement from the @Ticats on Johnny Manziel". Hamilton Tiger-Cats official Twitter. February 14, 2018. Retrieved February 14, 2018. We wish Johnny Manziel well as he embarks upon a return to football. ^ Nathan, Alec. "Johnny Manziel to Join the Spring League Scouting Event Amid NFL Comeback". ^ "Manziel: I'll play in CFL if NFL not interested". ESPN.com. Retrieved March 27, 2018. ^ "Manziel: If no NFL, 'I'm going to play in the CFL' – Article – TSN". TSN. March 27, 2018. Retrieved March 27, 2018. ^ "Johnny Manziel says he will play in the CFL if he doesn't find an NFL team". CBSSports.com. Retrieved March 27, 2018. ^ "Manziel announces two-year deal with Ticats – CFL.ca". CFL.ca. May 19, 2018. Retrieved May 19, 2018. ^ "Report: Johnny Manziel traded to Montreal Alouettes". July 22, 2018. ^ "Manziel traded to last-place Montreal in CFL". ^ Seifert, Kevin (July 31, 2018). "Johnny Manziel to make first CFL start Friday against Tiger-Cats". ESPN. Retrieved July 31, 2018. ^ "2018-08-03 Game Tracker – Hamilton Tiger-Cats vs. Montreal Alouettes (2495) – CFL.ca". CFL.ca. ^ "Manziel on debut: 'This game humbles you' – CFL.ca". August 3, 2018. ^ "Johnny Manziel improves in second CFL start for Alouettes". www.chron.com. August 12, 2018. ^ "Johnny Manziel doesn't throw a pick but takes a blow to the head in second CFL start". www.washingtonpost.com. ^ "Leeds' Jonathan Rose crushes Johnny Manziel with goal-line hit in CFL". ^ "Alouettes issue statement on Johnny Manziel – CFL.ca". August 15, 2018. ^ "Manziel placed into CFL's concussion protocol". ^ "2018-08-18 Game Tracker - Montreal Alouettes vs. Edmonton Eskimos (2502) - CFL.ca". CFL.ca. ^ "Pipkin shines as Montreal powers past Redblacks to avoid season sweep | CBC Sports". CBC. Retrieved September 6, 2018. ^ "2018-09-21 Game Tracker - Montreal Alouettes vs. Winnipeg Blue Bombers (2519) - CFL.ca". CFL.ca. Retrieved September 27, 2018. ^ "Johnny Manziel vows improvement in 2019". American Football International. November 8, 2018. Retrieved December 5, 2018. ^ Smith, Michael David (November 6, 2018). "Johnny Manziel happy in the CFL after finishing season with 5 TDs, 7 INTs". ProFootballTalk. Retrieved December 5, 2018. ^ "Alouettes quarterback Johnny Manziel "happy" with first taste of CFL". ca.sports.yahoo.com. Retrieved December 5, 2018. ^ "Johnny Manziel Has Proven He Can Still Make An Impact In The NFL". TheSportster. November 11, 2018. Retrieved December 5, 2018. ^ Carpenter, Les (August 4, 2018). "'Only up from here': reason for hope amid Johnny Manziel's dire CFL debut". The Guardian. ISSN 0261-3077. Retrieved December 5, 2018. ^ Cowan, Stu; January 25, Montreal Gazette Updated:; 2019 (January 25, 2019). "Alouettes will have a battle for starting QB job at training camp | Montreal Gazette". Retrieved February 1, 2019. ^ "Alouettes release QB Johnny Manziel". Canadian Football League. February 27, 2019. Retrieved February 27, 2019. ^ < Lorenzo Reyes (June 6, 2018). "For Johnny Manziel, recovery takes priority amid comeback in CFL". USA Today. ^ Justin Dunk (February 28, 2019). "Johnny Manziel skipped meetings required by the CFL: sources". 3DownNation. ^ Luca, Greg (March 16, 2019). "Report: Manziel signs with AAF, but San Antonio Commanders release his rights". San Antonio Express-News. Retrieved March 16, 2019. ^ Evans, Jace (March 16, 2019). "Johnny Manziel joining Alliance of American Football's Memphis Express". USA Today. Retrieved March 16, 2019. ^ Bergman, Jeremy (March 24, 2019). "Johnny Manziel makes AAF debut as Express top Iron in OT". National Football League. Retrieved March 26, 2019. ^ Hookstead, David (March 30, 2019). "JOHNNY MANZIEL SUFFERS SCARY HEAD INJURY AGAINST THE ORLANDO APOLLOS". The Daily Caller. Retrieved March 30, 2019. ^ "AAF suspends operations; Polian 'disappointed'". ESPN.com. April 2, 2019. Retrieved April 4, 2019. ^ "Johnny Manziel". pro-football-reference.com. Sports Reference LLC. Retrieved September 2, 2016. ^ "Johnny Manziel runs for 2 TDs in Spring League finale". NFL.com. Retrieved April 14, 2018. ^ "Johnny Manziel now at a crossroads with football future". New York Post. April 13, 2018. Retrieved April 14, 2018. ^ Boren, Cindy (April 8, 2018). "An 'emotional' Johnny Manziel shows mixed results in Spring League game". Chicago Tribune. Tribune Publishing. Washington Post. Retrieved April 16, 2018. ^ "Stats - CFL.ca". CFL.ca. Retrieved September 30, 2018. ^ "Stats - AAF.com". AAF.com. Retrieved March 26, 2019. 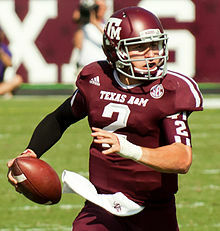 ^ "Johnny Manziel of Texas A&M University Selected As The 2012 Heisman Winner" (pdf). The Heisman Trust. Retrieved January 1, 2014. ^ SportsDayDFW.com (December 6, 2012). "Texas A&M's Johnny Manziel becomes first freshman to win Davey O'Brien Award; Heisman next?". Dallasnews.com. The Dallas Morning News Inc. Retrieved January 1, 2014. ^ Fornelli, Tom (December 11, 2012). "AP releases 2012 All-America Teams". CBSSports.com. CBS Broadcasting Inc. Retrieved January 1, 2014. ^ "FWAA > News > 2012 FWAA All-America Team". Sportswriters.net. December 14, 2012. Retrieved January 1, 2014. ^ a b "Walter Camp Football Foundation Announces 2012 All-America Team" (pdf). Walter Camp Football Foundation. ^ "College football All-Americans: Sporting News' take on the best – NCAA Football". Sporting News. Retrieved January 1, 2014. ^ "AT&T ESPN All-America Team – NCF Nation Blog". ESPN. Retrieved January 1, 2014. ^ CBSSports.com staff (December 3, 2012). "2012 College Football All-America Team – NCAA Football". CBSSports.com. CBS Broadcasting Inc. Retrieved January 1, 2014. ^ "Scout.com: FoxSportsNext.com 2012 All-America Team". Collegefootball.scout.com. December 6, 2012. Retrieved January 1, 2014. ^ College Football (December 11, 2012). "SI.com's 2012 All-America Team". Sports Illustrated. Time Inc. Retrieved January 1, 2014. ^ Greenberg, Steve. "Johnny Manziel named Sporting News' 2012 player of year". Sporting News. Retrieved December 7, 2012. ^ a b c "Manziel, Schmitt Named SEC Athletes of the Year > SEC > NEWS". Secdigitalnetwork.com. February 7, 2013. Retrieved January 1, 2014. ^ "Press Releases – AT&T Cotton Bowl Classic". Attcottonbowl.com. January 5, 2013. Retrieved January 1, 2014. ^ "ESPN.com's 2012 All-bowl team". ESPN. Retrieved January 1, 2014. ^ Taylor, John. "Johnny Manziel named SEC Male Athlete of the Year". NBC Sports. Retrieved July 2, 2013. ^ "Texas A&M Presented Chick-fil-A Trophy As Manziel and Hurd Jr. Claim Offensive and Defensive MVP Honors". KBTX.com. January 1, 2014. Retrieved January 1, 2014. ^ "Manziel Named Heisman Trophy Finalist – Texas A&M Official Athletic Site". AggieAthletics.com. Retrieved January 1, 2014. ^ a b "Southeastern Conference". Retrieved February 3, 2016. ^ a b c d e f Mark Berglund. "Season Yards Leaders List". FBS Statistics. Retrieved January 1, 2014. ^ "SEC Football Players of the Week > SEC > NEWS". Secdigitalnetwork.com. October 14, 2013. Retrieved January 1, 2014. ^ a b "Archie Manning on Manziel breaking his record: 'Thanks a hell of a lot'". Dallasnews.com. The Dallas Morning News Inc. Associated Press. May 4, 2013. Retrieved January 1, 2014. ^ a b c d e f g h i j k l m "Texas A&M Aggies Football Statistics". Totalfootballstats.com. Totalfootballstats.com. Retrieved January 1, 2014. ^ Gribble, Andrew (December 29, 2015). "Four Downs: Just how rare was a rushing performance like Johnny Manziel's?". clevelandbrowns.com. Retrieved July 28, 2016. ^ "Texas A&M Aggies freshman QB Johnny Manziel arrested". ESPN. June 29, 2012. Retrieved January 1, 2014. ^ "Manziel pleads guilty to 2012 misdemeanor charge, other charges dismissed". The Eagle. Retrieved January 1, 2014. ^ Tim Rohan (November 23, 2012). "Johnny Football: Raising a Heisman Contender". The New York Times. Associated Press. Retrieved January 1, 2014. ^ Scribd (June 29, 2012). "College Station Police Department Probable Cause Statement". Scribd. Retrieved January 1, 2014. ^ Sam Khan Jr. (August 17, 2013). "Manziel's improvement earns Aggies QB job". ESPN. Retrieved January 1, 2014. ^ "A&M QB Manziel says he's sorry for summer dustup – Aggie Sports: Football". Aggie Sports. Retrieved January 1, 2014. ^ "Johnny Football Videos". Archived from the original on December 7, 2012. Retrieved December 2, 2012. ^ Grassie, Matt (July 22, 2013). "DPS: King says Manziel comes with major red flags". Yahoo! Sports. Retrieved January 1, 2014. ^ Robbins, Lenn (July 22, 2013). "Manziel's 'Heis'… and lows of offseason". New York Post. Retrieved January 1, 2014. ^ Jenkins, Sally (February 24, 2011). "Johnny Manziel may be immature, but his critics are childish". The Washington Post. Retrieved January 1, 2014. ^ Chris Low (July 17, 2013). "What we learned at SEC media days". ESPN. Retrieved January 1, 2014. ^ Andy Staples (July 17, 2013). "Johnny Manziel coming to grips with life in the limelight". Sports Illustrated. Retrieved January 1, 2014. ^ "Joe Theismann's Advice for Johnny Manziel: Don't Be Yourself « CBS DC". Washington.cbslocal.com. July 23, 2013. Retrieved January 1, 2014. ^ "Johnny Manziel overslept at Manning Passing Academy". NFL.com. July 29, 2013. Retrieved January 1, 2014. ^ Schwab, Frank (June 19, 2013). "Johnny Manziel's angry College Station tweet? It was over a parking ticket". Yahoo! Sports. Retrieved January 1, 2014. ^ "Johnny Manziel ushered out of party". ESPN Internet Ventures. July 29, 2013. Retrieved January 1, 2014. ^ Wright Thompson (July 30, 2013). "The trouble with Johnny". ESPN Internet Ventures. Retrieved January 1, 2014. ^ "Manziel in treatment for undisclosed reason". Retrieved August 19, 2016. ^ "Police: Johnny Manziel threw water bottle at heckler at PGA tourney". Fox Sports. May 31, 2015. Retrieved November 15, 2015. ^ "Report: Browns 'so done' with Manziel, so what's next for him?". Yahoo! Sports. Retrieved January 4, 2016. ^ "Manziel goes AWOL on Sunday". Retrieved January 4, 2016. ^ "LeBron James' marketing agency is dumping Johnny Manziel". ^ "Johnny Manziel's Agent Dumps Him". Michael David Smith. NBC Sports. February 5, 2016. Retrieved February 5, 2016. ^ Bell, Jarett (February 5, 2016). "Bell: Dear Johnny Manziel, get the help you clearly need". USA Today. Retrieved February 5, 2016. ^ "Drew Rosenhaus officially ends relationship with Johnny Manziel". ESPN. ^ "Darren Rovell on Twitter". ^ "Johnny Manziel is pursuing Texas A&M degree from LA, taking online classes | SportsDay". SportsDay. September 5, 2016. Retrieved February 25, 2017. ^ "Johnny Manziel, prosecutors finalize agreement in assault case". ^ "Drake's new 'Draft Day' song features shoutout to Johnny Manziel". CBS. ^ Sean Lester (September 25, 2013). "Rap artist Drake says he keeps up with Johnny Manziel through Aggie radio app: 'I feel like our friendship will last a very long time'". Dallasnews.com. The Dallas Morning News Inc. Retrieved January 1, 2014. ^ "Johnny Manziel and Bre Tiesi are officially engaged". Houston Chronicle. March 10, 2017. Retrieved March 10, 2017. ^ "Johnny Manziel Marries Model Bre Tiesi in Private Secret Ceremony: 'He's Crazy About Her'". ^ "Manziel says he's bipolar, trying for comeback". ESPN.com. Retrieved February 12, 2018. ^ "Johnny Manziel: Alcohol, bipolar disorder nearly ruined me". New York Post. February 12, 2018. Retrieved February 12, 2018. Wikimedia Commons has media related to Johnny Manziel.